On Tuesday, February 21, 2012, Kohls off 544 in Myrtle Beach, will host a Kohls Cares Car Seat Safety check from 3 to 6 p.m.
At the event Safe Kids certified child safety seat technicians will inspect the installation of car seats, correct those installed incorrectly, and offer a new seat to those who have one that is damaged or otherwise unusable. There is one seat available per car while supplies last. You can find out more about the event and those organizing it on the Responsible Safety blog here. The statistics are staggering. Research from other states reveals that nearly three out of every four car seats are installed improperly, putting your child at risk for unintentional injury. Couple that with our sub-par car seat laws in South Carolina and our children could be in real, UNNECESSARY, danger. If you’re able to get your car seat checked on Tuesday, please do so. It’s free. It’s quick. It could mean all the difference in a car accident. 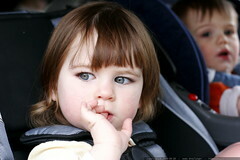 Many of us take tons of time to educate ourselves on car seats and purchase the very best one our budgets will allow. Sadly, none of that matters if the seat is installed correctly. If you plan to attend, it’s best to have the seat in the car you typically use and your child. In addition to an installation inspection, technicians will also assess how the straps fit with your little one in the seat. If you’re an expectant parent, bring the seat in the car it will be used. If you have questions, contact the Safe Kids Pee Dee/Coastal Chapter at (843) 777 – 5021. For more information about the location, including a map and phone number, click here.